About — Blake Canfield & Son, Inc. Many of our employees have been with us for more than a decade. We are extended family. Our team's knowledge and expertise in our line of work has earned us our excellent reputation in the Baltimore area. Blake Canfield and Son, Inc. partners with the JL Interiors & Restoration LLC design firm in order to offer their clients design expertise on any of their projects. Working exclusively with Wellborn Cabinet, Inc. allows us to offer a quality cabinet, with an extensive selection of door styles, door materials and finish combinations. Wellborn Cabinet, Inc. has been manufacturing quality kitchen and bath cabinets since 1961, located in Ashland, Alabama. Made in U.S.A. The owner of JL Interiors will meet with you to understand your vision and goals to create and achieve the perfect space, working alongside Blake Canfield & Son during the renovation and installation process. 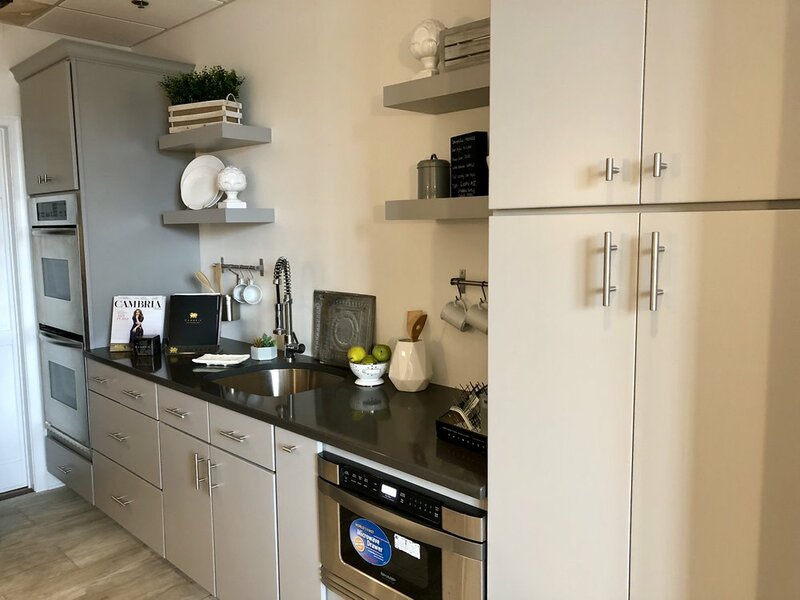 The four kitchen showroom features cabinetry, countertops, appliances, hardware, flooring and lighting in a variety of kitchen design settings so that you can see and compare your options easily. 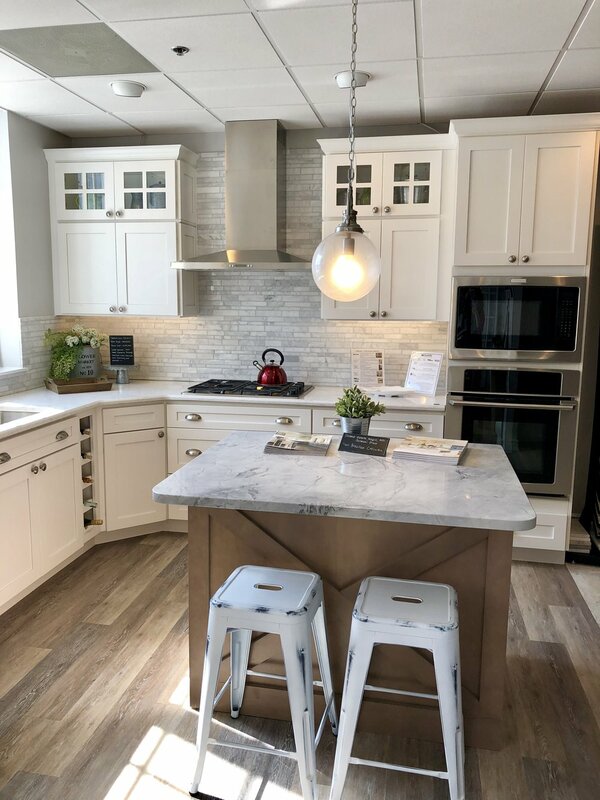 This beautiful kitchen features Wellborn Select Series Cabinets in MDF with Hancock style doors in Glacier White with a Cambria Torquay Quartz countertop. The island is from the Wellborn Estate Collection, Maple with an oatmeal stain . The island countertops are Brazilian Calcutta Quartz. This kitchen features the Wellborn Premier series cabinetry line, with maple cabinets, painted Dove. The cabinet door style is Milan, a full overlay door style giving a clean modern look. The countertops are MSI Quartz in Shadow Grey with an Eased Edge. This kitchen displays a stainless steel double wall oven, and drawer style microwave. This kitchen uses Maple Wellborn cabinets, in the Estate line, stained oatmeal, with a chelsea style door. This kitchen showcases 3 different cabinet styles. The base cabinets are cherry wood in a natural stain finish with a prairie style door. The wall cabinets are MDF in a glacier java color with Camden Square style doors. The cabinets on the pennisula are Maple, in a Honey Java Color, harmony style with a classic drawer front, and custom paneling on the back. Countertops are Uba Tuba granite with an Ogee edge. 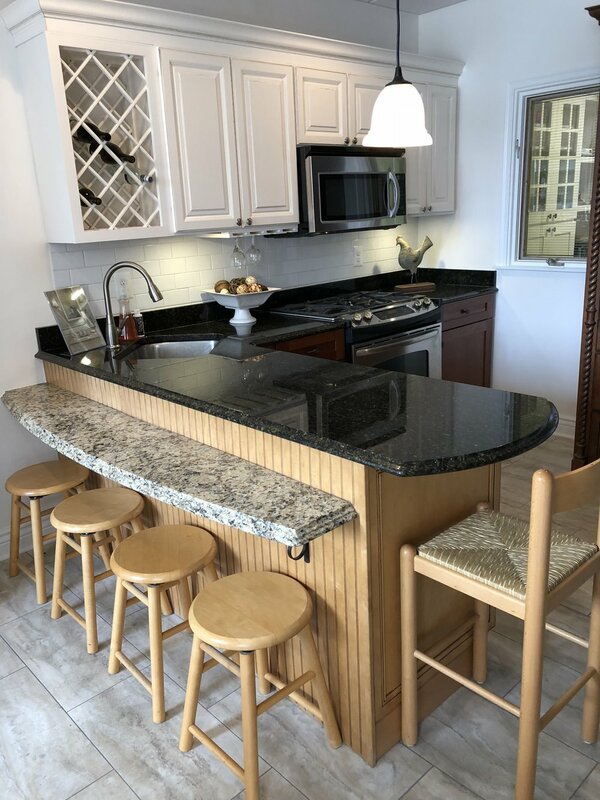 This wet bar display features Wellborns Premier Cabinet line with a Bali style cabinet door as well as custom glass doors and reduced depth cabinet bases. The maple cabinets are stained drift slate. Our Laundry Room display features the Wellborn Premier Series Cabinet line with an Antingua full overlay door style. These maple cabinets are painted porcelain in color, and the crown color is Glacier White. This display has a beautiful farm sink, custom barn wood countertops and open shelving. This bathroom displays Maple cabinets, in a Glacier color, the door style is Hanover. The counter tops are silestone Cygnus, Quartz with a quarter roundover edge. This bathroom cabinetry is Cherry Wood, bristol Style with a slab drawer front in Espresso. The countertops are Granite Azul Platino Color with standard edge.